The offside trap is a defensive tactics that if executed perfectly can mean less stress for the defenders, because the referee will have to award an indirect free kick in favor of the defending team, thereby wining the ball for the defending team without any tackle or misconduct from players of the attacking team. The following are things you should know when it comes to teams using the offside trap during a football match. 1. For an offside trap to be executed perfectly, the defenders/back line need to line up straight across the pitch. This means that the three (3) or four (4) defenders who make up the back line try as much as possible to be in a parallel line, so that they move up or down the field in unison. 2. During a match it is up to one defender -usually one of the central back - to decide whether or not to execute the offside trap when the opponent want to play the ball forward. His decision is usually bases on the position of the attacking player, so it in is opinion, a few steps forward would suddenly put the striker offside, then he will move the line up and possibly win a free kick. But if he believes that the opponents will play the ball before the defense can step up, then he will likely tell/motion to his teammates to drop back and take a different defensive approach. 3. The style of play of the opponent usually is a determinant factor for coaches to know if it will be wise to instruct his back line to deploy the offside trap during a match. 4. 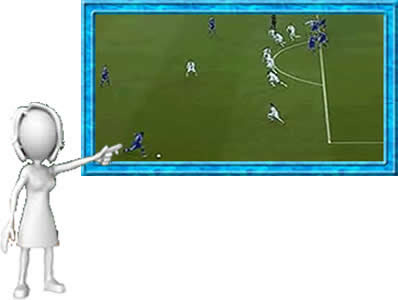 Though the offside trap can be unreliably risky, the secret behind perfect execution of the offside trap lies in coordinating, timing, and identifying those moments when the opponents is ready to play the ball forward.